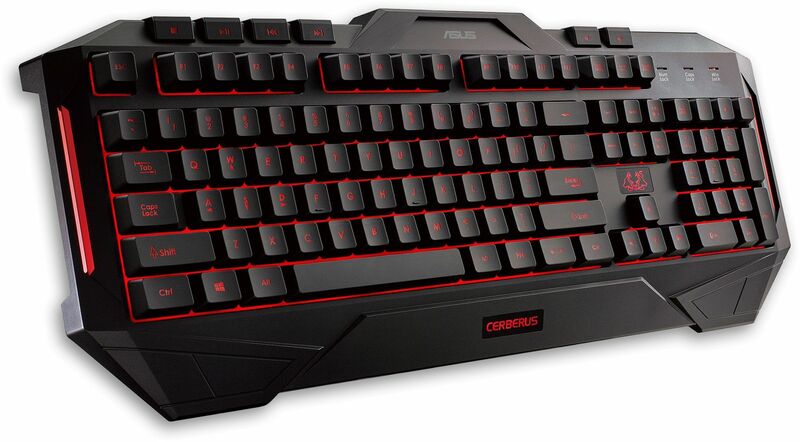 The ASUS Cerberus is a rugged LED backlit USB keyboard with splash-proof design. Forged from a full SECC metal plate, Cerberus Keyboard has a rugged, durable design that stands up to the rigours of continuous use. Cerberus keyboard features a splash-proof design to protect against accidentally spilled liquids. An integrated drain hole prevents liquids from being trapped inside the keyboard and ensures easy clean-up after spills, providing minimal disruption. Cerberus Keyboard is equipped with 12 dedicated and easy-to-reach macro keys, so you can issue custom commands with a single keystroke and enjoy complete tactical flexibility. With fully rubberised feet that provide enhanced friction on any surface, Cerberus keyboard stays firmly in place during even the most intense sessions, so you can push for the win without pushing your keyboard around. As the image above shows the user can choose from Red or Blue backlit colours, there are even four different light settings including breathing mode! As well as the fancy lights which make it easier to see the keys in a darkened room, the Cerberus keyboard features the following media keys: volume control, play/pause, previous / next track.